DECALS: Pan Am and ???? Forever in the annals of great Science Fiction movies is thegroundbreaking 2001 of 1968. In this movie so many of the effects that wesee everyday on the small and large screen got their start. It is also one ofthe few sci-fi movies to portray accurately the physics of space. No swoopingspace fighters, no groaning low frequency noises as gigantic vehicles passoverhead. All motion is determined by reality and not by earthly atmosphericeffects. One of the most visually interesting scenes is early in the movie asthe Pan Am spaceliner slowly, serenely, and accurately maneuvers itself intoposition for entry into the space station. It is in many ways quite unfortunatethat most modern movies do not portray space in the way it is; instead relyingon earth bound physics and fantasy to portray motions in space. Nonetheless, 2001is a movie that I watch frequently; not only for its historical import but justto see those neat spacecraft! 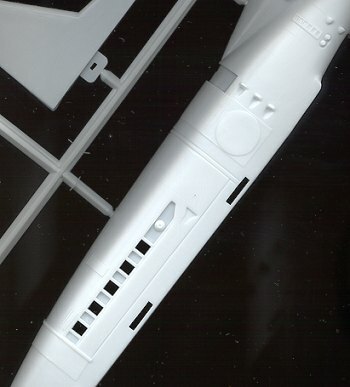 The Orion spaceliner is a kit that has been mass marketed onlyby Aurora and Airfix, though there have been quite a few garage resin kitsavailable from time to time. Aurora's is now a collector's kit, while this isthe third release from Airfix. The first was in Pan Am markings and the secondin the rather fanciful and ugly ones shown on the box top. Fortunately, the PanAm decals are included in the kit. Well, what does oneget in terms of vintage plastic? Actually, despite the size of the box(due to the long fuselage), there are darn few pieces. Including three clearbits there are 15 parts to the spaceliner and two for the stand. That is it. Nolanding gear, no opening canopy. The kit itself is mostly raised panel lineswith the rest of the detailing a bit overdone and blocky. See the image to theright. The kit is too big to fit on my scanner for a complete parts rundown.Again, this is a 25+ year old kit! I won't comment on its accuracy; after all,it is a movie model. However, it does look just a bit different that what I canrecall from the movie. Mostly the nose, I guess. It seems to me to be more ovaland a bit cut back on the top on the movie version. I'll be dragging out the DVDon this one and doing some stop action comparison before building it. 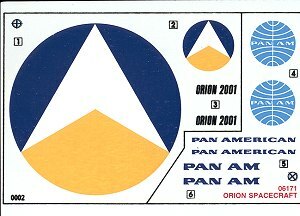 The decal sheetis adequate for the Pan Am version, and why they included the other markings isbeyond me, but they did. Maybe the kiddies will like the nice colors. Theinstruction sheet is the standard pictorial diagram version in 5 steps. Colorcallouts are by Humbrol paint numbers, without any indication of what the colorsare. Frankly this type of thing is irritating at best. At least Airfix could saythat 33 is flat black and 22 is gloss white. Humbrol paints are not availableeverywhere, you know. Anyway, it is nice to see this one back in circulation. Probablymakes the kit collectors cringe now that this kit can be had for less than $50!I plan on getting a few more to tide me over the next 15 year drought after thisproduction run is over with and to try out a few more airline liveries on! Withthe stand provided, it isn't going to take up much room and will look very coolamongst the other sci-fi movie and TV stuff I have on the shelf. If you would like yourproduct reviewed fairly and quickly by a site that has over 800 visits a day,please contact me or see other details inthe Note toContributors.